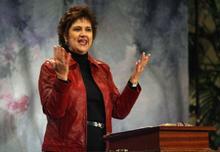 Jean Stockdale... : "Proverbs and Principles for Parenting"
Not Me. Surely that is Not Me! For the last 30 years I have been a SAH mom. My husband, Craig, and I have raised and released 2 great guys into the adult world. Both guys are married and have babies of their own. It is tremendously satisfying to watch them build their own household of faith. I have been a Christian for 30 years now. Having coming to know Christ st the age of 24, I developed a veracious appetite for the Word of God.For nearly 26 of those years, I have been a Bible teacher and Christian Conference speaker. I have no greater joy then teaching women, especially moms, how to study God's Word and make its profound truths become practical for daily living. For the last 20 years I have been writing my own Bible studies and teaching moms how to train up children according to God's standard. Two years ago, Craig and I sensed the Lord leading us to publish my Bible studies for MOMS and create DVDs to accompany them. 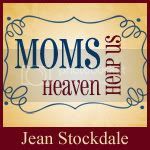 This would allow individuals to do the interactive studies, or small groups and churches to add a ministry to MOMS to their Bible study programming. In the last 2 years, I have written and published 6 Bible studies with accompanying DVDs. Studying God's and teaching women about the fine art of Christian mothering has become the driving passion of my life. My studies are available on my own website, Amazon.com, Barnes and Noble.com, and other on-line vendors. But imagine my surprise and subsequent delight when we spotted my book on the shelf of our local Barnes and Noble's store. My first book, Proverbs and Principles for Parenting Practically Perfect Progeny, was situated between other well-known authors. I think I had an out-of-body experience! Not Me! Surely that is not me! Here are the photos. You can judge for yourself. For more fun stories, check out My Charming Kids or just click here.Blessings.